The zebra plant is a living ornamental accent that can be found in many homes, with foliage featuring bold stripes and bright colors. The zebra plant is not the easiest species to cultivate indoors, but its distinctive striped patterning is well worth the effort. By creating a tropical microenvironment in your home, you can help your zebra plant to grow to maturity. This species is able to thrive in an indoor environment when given the proper care and TLC that it needs. Calathea zebrina, or the zebra plant, is one of the most popular breeds of plant in the Calathea family. It is often confused with Maranta leuconeura, also known as the prayer plant, and the similarly nicknamed Aphelandra squarrosa zebra plant. While both of these other plant species share a striped appearance with Calathea zebrina, neither are able to reach its impressive size. Native to Brazil, the zebra plant is named for its ovate, bright green leaves that are streaked with shades of darker evergreen. The top side of each leaf is coated in fine velvety fuzz, while the underside is a rich, dark purple. Leaf stems can grow up to one meter in height at their maturity. This perennial plant may produce purple or white flowers in the summer, but it is highly unlikely to bloom indoors. This isn’t a problem for most gardeners and homeowners, as this plant is grown for its magnificent foliage rather than its blossoms. In fact, many people remove their plant’s flower stems before budding so that no energy is wasted on fruitless reproductive efforts. The zebra plant experiences a growth cycle each year that lasts from mid-spring until late fall. The beginning of this growth cycle is the best time to repot, prune and propagate your plant to produce healthy and luscious new growth. In the spring, you should use a fresh peat-based potting mix to repot your plant. Two parts peat and one part perlite is a good combination for either young or mature zebra plants. You’ll have to repot more often during the beginning of your plant’s life, but once it reaches maturity, you should only have to transfer your plant to a larger pot once every other year or so. You can learn how to repot a zebra plant from our friends at Growing Wisdom. To propagate a new plant, you can divide the main plant during the repotting process. Plant each section in its own pot and keep the new plants shady, warm and moist by covering them with plastic. You should remove the plastic once you start to see fresh growth appear. While the zebra plant grows to greater heights than other calathea varieties, it can also be more difficult to grow successfully. You can pick up a few tips and tricks on how to care for a young calathea plant from the experts and PlanzNThings. As a native to the tropics of Brazil, this plant needs a warm and humid environment to survive. You also need to make sure that the plant is getting plenty of light, water, and essential nutrients. If you are growing your zebra plant indoors, be sure to place it in a warm spot. Temperatures of 65 to 75ÂºF are ideal, while anything lower that 60 can cause damage to the plant. You should keep your plant away from drafty areas or anywhere that’s likely to experience sudden fluctuations in temperature. In the wild, Calathea zebrina grows on the forest floor. The plant is adapted to growing under the shade of a canopy in bright, partial light. When living indoors, the zebra plant needs to be kept in a well-lit room that will filter incoming sunlight, such as a greenhouse or a conservatory. The zebra plant needs high levels of humidity in order to grow. Misting the plant can help to keep the soil damp, but it often doesn’t provide the necessary moisture in the surrounding air. You may want to purchase a humidifier or use a humidity tray if your plant is showing signs of being too dry. You can also store your plant in a bright bathroom, as vapor from baths and showers can help to keep the plant in a warm and moist environment. In addition to a humid surrounding environment, the zebra plant requires plenty of water in its soil in order to survive. You should keep the soil moist at all times during your plant’s growing season, watering your zebra plant as much as needed to prevent the soil from drying. Calathea zebrina slows or halts its growth cycle in the winter and thus requires less water, so you should cut back on your irrigation routine starting around November. When watering your plant, you should avoid hard water or water that’s too cold. It’s best to use distilled water at room temperature. During your plant’s growing season, you should aim to apply a balanced liquid fertilizer every two weeks or so. Using half strength fertilizer will prevent your plant from growing too leggy. When growing Calathea zebrina, you need to use a delicate touch. This high-maintenance plant is beautiful, but it is not the most forgiving when abused or mistreated. There are a few common environmental factors that can have a heavy impact on how your plant grows. Too much or too little water can hinder the healthy development of your zebra plant. While underwatering can lead to curling leaves and the development of unsightly brown spots, overwatering can lead to drooping and stem rot. If leaves turn brown and start dropping off, it’s probably because the surrounding humidity level is too low for your plant’s comfort. The first sign of low humidity is leaves browning around the edges. Dry air quality can be especially problematic during winter months, so make sure you take special care to artificially humidify your plant’s surroundings. Changes in leaf color may indicate that your zebra plant is getting too much sun. 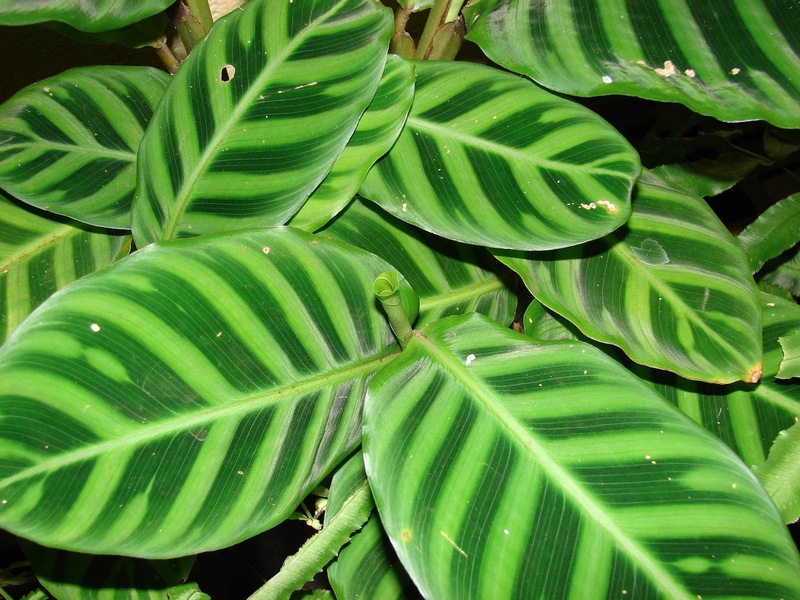 While Calathea zebrina is partial to bright light, too many hours of direct sunlight can lead to scorching and burning. Not only will this affect the plant’s health, but it can also cause its leaves to lose their attractive zebra-pattern markings.